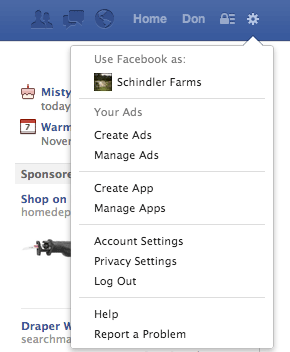 There are plenty of concerns about Facebook privacy – and rightly so, you are probably going to share more information about yourself and your family, friends, coworkers, and your farm, then on any other platform. I love the show, “Person of Interest” on CBS. It tells the story of a man who’s built a machine that spies on every person in the U.S. looking for terrorists. But after the man turned the machine over to the govt., he is now resolved to try and save the people that the machine predicts are going to die but the govt. doesn’t care about. Loss of privacy is the basis of the show. With Facebook, you are giving it a lot of privacy if you choose to engage but if you understand a few basics then you shouldn’t have a problem with privacy. I get asked this a lot but identity theft (as far as I understand it) happens mostly via banks and credit card companies than Facebook – they may find some information on you but all they really want is your username/password to your financials (which usually isn’t found on Facebook). If you are worried about groups targeting you and your farm, I would also say that I have not heard of a single case of the group using their social media profiles to target physical addresses. This doesn’t mean it doesn’t happen – but what I would say is that if you have a large social media presence you are actually more of a threat to them because you will have so many people come to your (online – defending and promoting) aid if you have a issue on the farm. All the privacy and security settings in the world will not protect you if you say bad things on the internet. In fact, Facebook is one of the worst for keeping these things to yourself. You can voice your opinion about injustice without berating and crucifying others. Remember you are in front of your audience, their audience and the entire Facebook public. And you can always walk away if it isn’t going well. So let’s get into the Security and Privacy Settings so change a few things that will help protect your privacy but not completely cut you off from the rest of the world that may benefit quite a bit from hearing your wisdom about farming. Change the username to something more appropriate than what Facebook gave you – if they gave you a long list of numbers (back in the day they did this). 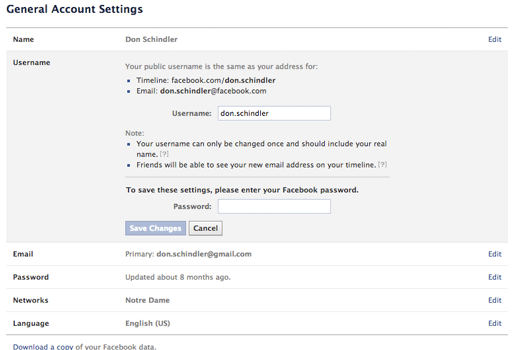 Facebook gives you an email address like don.schindler (at) Facebook.com. I switch to the email that makes most sense to me. That should be it for this screen unless you have an email address associated with a university. If so, you can set up one of their networks. This will help protect you when you are using an open network like a coffee shop or airport. It helps keep people from hacking your account. 7. Click “Login Notifications” and make sure you set it to “Email” or “Text/Push Notifications”. These two areas will help you understand what has logged into your account last and where. If you have any active sessions from areas that you are unfamiliar then you should delete the sessions. The other areas you can look into and Facebook does a good job of explaining them so I won’t do it here. 10. Who can see your future posts? This should be public. You can always change this on a specific post if you want only a certain list of friends or a specific friend/s or just yourself. 11. Review all your posts and things you’re tagged in. 12. Limit the audience for posts you’ve shared with friends of friends or public? This feature was developed so people could limit all of their old posts from “friends of friends” and “public” to switch “friends”. In other words, hid their past from anyone that wasn’t already a friend. I don’t recommend this unless you have damaging images and posts out there and you want them all invisible to the public. 13. Who can send you friend requests? I marked this as everyone because I want to be able to be “friended” even if someone isn’t connected to one of my friends. This will not keep you out of search results – people just won’t be able to friend you if they aren’t a friend of one of your friends. 14. Whose messages do I want filtered into my Inbox? 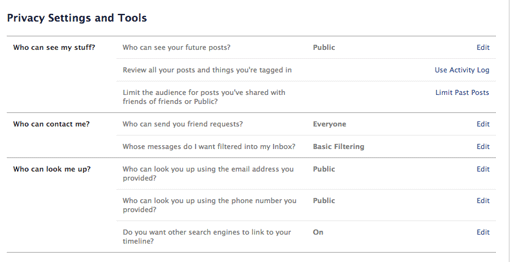 I would recommend the “basic filtering” which means that most Facebook email messages will get to you. 15. Who can look you up using the email address you provided? Now I give out my email address a lot for people to connect so I have this marked to public. If you want just “friends of friends” or just “friends” to be ale to do this you can. TIP: Sometimes young people don’t want to be found by their parents on Facebook – they use an alias – but if you have their email and they haven’t changed this setting, you can find them on Facebook using this tool. 16. Who can look you up using the phone number you provided? Same answer as the email address. 17. Do you want other search engines to link to your timeline? Now this one is going to be different for me vs. you. I’m open on the internet and I want the search engines to find my information. You might not want that. So if you are worried about Google finding your information, then you might want to uncheck the box. Next blog post – Timeline and Tagging (Facebook 101 – Part 3) Coming soon.